Are you a big Kingdom Hearts fan? Did you trade in your normal PSP for a sleek and shiny PSP Go last year? Then you won't be playing Kingdom Hearts: Birth By Sleep any time soon. Amidst rumors that the latest entry in the Kingdom Hearts series, due for UMD release next month, would not see a digital release, blogger and Arizona Daily Star writer Phil Villarreal contacted Square Enix PR firm Ogilvy for a firm answer, and that answer is no, there are no plans to release Kingdom Hearts: Birth by Sleep on the PlayStation Network, which is the only way PSP Go owners would be able to play it. We reached out to Square Enix to confirm the news, and were given the same answer. On the plus side, the Square Enix representative did say there were "currently no plans," so that could change sometime in the future. This is sad news for PSP Go owners, or PSPGowners, as I've come to call them. Since the handheld was launched 11 months ago, nearly every title released has seen a near simultaneous release on PSN. Perhaps this admission means that companies are finally accepting the fact that the PSP Go is a failed experiment. 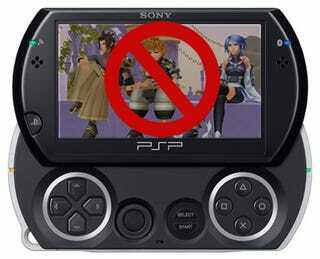 Sounds like a great time to invest in a Birth by Sleep PSP-3000 bundle, doesn't it?